Safe-Money.Biz is a SCAM! WARNING! Safe Bargains Corp Limited Investment Fund, simply known as Safe Money, is one of the most well known investment companies in the Internet. The Safe Money Fund has been active since 2010, making it one of the oldest online High Yield Investment Programs (HYIP) in the world, if not the oldest. Many people have heard about the site, or at least seen its name in various investments forums. However, only a few people have interacted with them, the vast majority are still in the dark, not knowing whether to risk their money in an unproven and figuratively unknown investment fund or keep it for more important things – you know, like that bottle of whiskey. In this article, we set about to deconstruct the carefully crafted scam that is Safe Money and hopefully save you, or someone you know, from being scammed. Safe Money is simply put a Ponzi scheme masked as a well performing HYIP. 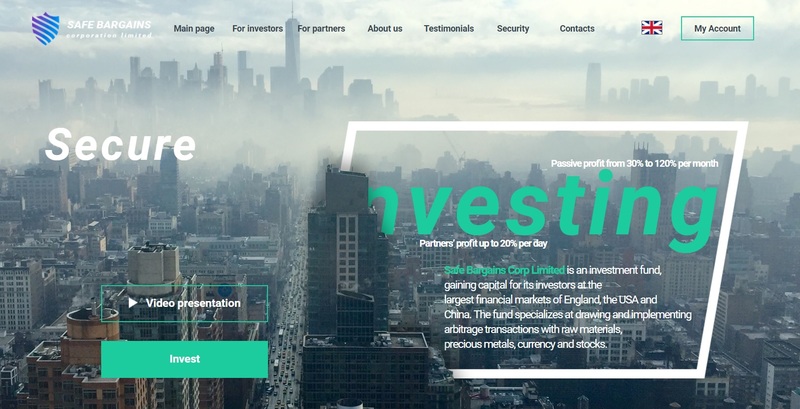 The site claims to have a team of well experienced financial traders who invest the money contributed by (naive) investors in financial markets spread all over the world to realize big profits, which are shared with the contributors depending on their contributions. Basically, the site offers 2 groups of investment packages, with 3 investment options in each. These are as follows. This is tailored for the small investors and gives daily returns ranging from 7% to 60%. The investment options are Gold Basic, Gold Standard, Gold Advanced and Gold Professional. For the big investors, or rather the people who have no problem investing large amount of money in an investment fund with zero credibility, there is the Platinum Package. The returns range from 72% to 117% and the minimum deposit is only $50. Account types include Platinum Basic, Platinum Standard, Platinum Advanced and Platinum Professional. In all plans, deposits can be made either in form of cash or cryptocurrency (Bitcoin) through the various channels available. As far as the alleged returns go, the site guarantees that you will start receiving them 24 hours after you make your deposit. Notably, returns will only accrue on working days (Monday to Friday) and will be available for withdrawal a day after reflecting on your account. That’s what they said. The reality is very different from that, as the section below explains. First, there are a lot of complaints about the seemingly deliberate delays in the withdrawal process. In some cases, the withdrawals take weeks and even months and in other cases they do not go through at all. Also, the entire concept that the site is built on is a big lie. No legit business will guarantee you the amount of profits that Safe Money is claiming. Making 117% profit in a single day? What is this, drug trafficking? Also, note that the exact activities the site is involved in are not mentioned in any way. This could mean two things. One, the said investments are in illegal business. As we have said, no legal business will give you 117% returns in a day, not even close to that. Two, that the alleged investment avenues only exist on paper. Most likely the latter. Additionally, while the safe-money.biz claims to be secure, when we tried to visit their website, we got a notification that their security certificate expired over a month ago. Safe Money Biz is a Ponzi scheme, set to defraud naive traders using all sorts of lies and extravagant posing. Do not allow yourself to fall into the trap. Our research indicates that the “Safe” Money Biz fraud is mainly targeting people in Europe, specifically Germany, Poland, Bulgaria and Russia. If you have already been scammed by Safe Money Biz, or if you have any feedback for us, please leave a comment below.